In essence, we all need silica, one of the vital thirteen minerals such as selenium, zinc, calcium, indium etc. Whilst we are born with sufficient, by the time of our mid forties most of it is used up, and, similarly to Vitamin C, we cannot store it, so need to supplement if we don't get it from vegetables - and sadly most vegetables grown today are from soil exhausted of minerals. Ordinary silica can't be transformed from diet into the organic form (i.e. with a molecule of carbon added) and is not therefore assimilated by the body. G5 Organic Silica is brought to England from the laboratory in Spain where it is made, which has been sanctioned by Dr Loic le Ribault, Organic Silica's discoverer and is sold as a food. It has become well known in Europe; France, Belgium and Spain for example, although in the UK it has only been in use since 1999. There are a growing number of satisfied users, and some doctors are now prescribing the product. Organic Silica (which has an added carbon molecule which helps easy ingestion by the body) is a highly active molecule which gives it the property of `seeking out the problem’. Its essential function is in the growth and regeneration of the body's cells so, while classified as a food and tested totally non-toxic, it can repair the body’s cells – typically those involved in arthritis, cardio-vascular problems, skin problems such as eczema and psoriasis. It makes for strong and healthy nails, skin and hair, and has been scientifically proven to strengthen bones, increasing bone density by up to 35% and can help prevent aging and may reverse degeneration of the brain such as associated with Alzheimer’s. (see attached Forres-Neilsen report for full details). It isn't affected by medication or drugs, nor does it affect them, and has no side effects. In helping to build up the body's natural immune system, it is also very positive in fighting a wide range of diseases and conditions. Indium and INDIUMEASE is a liquid mineral patented by George A.H. Bonadio in the USA, and is described as the missing-link unifying two major mineral groups to raise mineral uptake. Indium and INDIUMEASE have been tested for safety and Indium is the safest of trace minerals. It normalizes the master glands by increasing gland mineral absorption which helps anti-ageing recovery and can improve athletic performance and it may decrease drug, chemical and alcohol toxicity. It is the 7th rarest trace mineral, element #49. INDIUMEASE is Bonadio's patented process that makes Indium and INDIUMEASE absorbable for the first time in history. ”Indium is the mineral supplement you can live without, but you may not achieve optimal anti-ageing and disease resistance without it”. Indium was first tested in 200 mice compared to 200 controls by Dartmouth Medical School's Dr. Henry A. Schroeder, J.J. Balassa, Marian Mitchner, M. Kanisawa, A.P. Nason, and W.H. Vinton in 1964-68; who reported that INDIUM improved average Mineral absorption in the glands 142%; raised Chromium in all organs average 333%, enhancing Insulin that regulates muscle-building Protein and Carbohydrate energy in mammals. SAFETY: Indium is among the safest of trace elements, safer than Selenium & most minerals; there has never been a case of human poisoning from industrial use of Indium. Indium-sulphate was granted F.D.A. “Generally Recognized As Safe” G.R.A.S. status. Begin slowly, and reduce amount if under severe stress or multiple trauma to avoid too-speedy rejuvenation. Take in moderation, not excess. 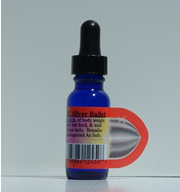 The recommended Patented INDIUM DAILY AMOUNT is 1 Drop per 50 lb. of body weight, containing 1 mg. 99.9% pure INDIUM as Indium-sulphate per drop. Swallow Drops on back of tongue on an empty stomach upon arising (7-10 hours after last food); & wait 10 minutes before eating. Begin taking one drop per day the first week, raising by 1 drop per day each successive week, to normal amount. NOTE: Indium has not been tested by any government agency, nor been approved to treat, cure, or prevent any disease. The above science and testimony abstracts are true, accurate and complete to best knowledge at this time, spoken freely for education and research purpose only, but not intended as medical advice nor implied to give results for anyone anywhere similar to those summarized. The best-known evidences to date result from objective scientific studies on animals, doctors’ reports, and citizens’ personal testimonies of proper IndiumEase usage of our advanced formula. Be sure to consult a qualified physician for any health problem(s) you may have.